One of the issues in the discussion of homebirths is that data are shown incompletely. If you want to participate in a reasonable discussion of any subject, it is crucial that you consider all facts, not just the ones you choose. Homebirths supporters usually emphasize that homebirths are associated with less costs, less interventions, less cesareans, less epidurals, less episiotomies. But that is only the partial truth. It is incomplete and omits the risks. Supporters of homebirths usually do not mention that the American Congress of ObGyn says the safest place to have your baby is in the hospital and that homebirths are associated with more neonatal deaths. 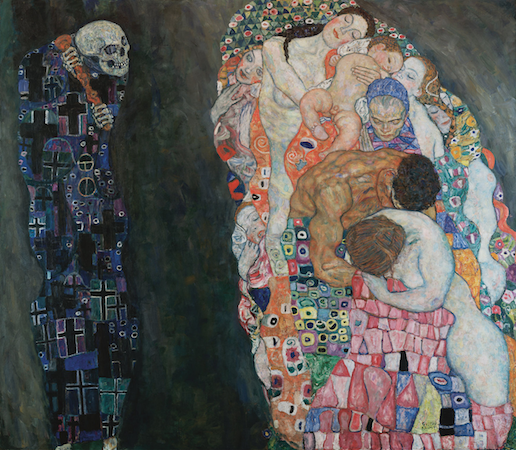 Take as an example the famous picture of Gustav Klimt called "Life and Death" from the Leopold Museum in Vienna/Austria. Homebirth supporters would only show a small part of that painting with a beautiful baby and mother. It's beautiful but misleading. We all agree that this is gorgeous. But by not showing the whole picture, it's also deceptive. As you can see, a beautiful mother and baby are threatened by death. This is exactly what Klimt wanted to show and what all of us must consider. As beautiful as childbirth is, it's potentially associated with misery and death. It's our job to make childbirth safer. Not just show the small gorgeous (deceptive) part of it. Ask questions about risks must be part of our efforts in improving care. Homebirth advocates (as well as others who emphasize only certain aspects but not others) are deceptive by emphasizing only the positive part, when in fact a serious observer must consider everything and not ignore risks.